Day 1 Tan Son Nhat International Airport , Nem Restaurant, Reunification Palace (Hoi Truong Thong Nhat), NhàHàngCreperie& Cafe, Notre Dame Cathedral, Hard Rock Cafe, The Golden Dragon Water Puppet Theatre, A Soi Restaurant. Day 2 Cu Chi Tunnels (Half Day Tour), Parkson Sai Gon Tourist Plaza, CơmTấm Cali, Highland Coffee, CáKèo Hot Pot, Ben Thanh Market. Day 3 Chinatown (Cho lon) - District 5, Chua Ba ThienHau, Quan Am Pagoda, ABC Bakery & Café , Phở Hòa Pasteur, Bonsai River Cruise Dinner. Day 4 Tan Son Nhat International Airport. These are our favorite places that we would recommend to you. If you travel to HCM City, give them a visit. Walking is definitely the safest way to visit this bustle city within a closed distance. We just want to mention a few safety things when you are walking around Saigon. Crossing the road in Sai Gon is our nightmare. When you are crossing the street, just remember to walk at a slow and steady pace and try to eye contact with the driver to catch their attention. You should never run across the street, just watch and walk slowly. If you see a car or larger vehicle approaching you should stop and wait until they have passed before continuing. Taxi in Sai Gon is more expensive than other transports but compare to some country, it’s quite cheap. Therefore, you can use this fast and convenient in such the busy city. Especially in the rainy season, taxi is the safest and most comfortable option. Taxi price starts at about 12,000 to 14,000 dong per kilometer. We traveled from the airport to the tourist area in Pham Ngu Lao, it costed us 100,000 dong. Xe Om is Motorbike Taxi service. This was our first time to use this service. If you want to get to your destination a little bit faster and a little bit cheaper, then there are motorbike taxi drivers parking along street and ask you: HEY YOU! Motorbike? Because traffic in Saigon can be so congested at times, especially during rush hour, they are often the best bet especially if you don't have to go too far. Don’t forget to agree on the price before getting on. They often ask you for twice as much as the usual fair once you get to your destination if you don't agree a price beforehand. When you ask the driver how much the ride will cost, the driver will usually ask you to pay 40,000 dong or more.This is a slightly high price, you should generally expect to only pay between 20,000 and 30,000 dong. Only ever pay more than 40,000 dong if you travel a long distance. Motorbike is very popular in Vietnam. To experience the local lifestyle, you can rent a motorbike in the city. Daily rates for bicycles are around 16,000 dong, while for motorbikes the daily rate is between 80,000 and 240, 000 dong depending on the size of the motorbike. When driving around and visiting places, always make sure to make use of the areas set aside for motorbike parking (guixe), otherwise you run the risk of having your motorbike stolen.And if the motorbike is stolen you will be expected to replace it with a new one. Also, it is now compulsory to wear a motorbike helmet. If the police pull you over for not wearing a helmet you will have to pay a fine of 300,000 dong. Most rental motorbikes will come with a helmet, but if you want to you can buy your own helmet for about 100,000 to 200,000 dong. Traveling around in a cyclo is interesting. It costs about 40,000 dong an hour, it is pretty cheap and unique way to travel.Cyclo is definitely not the mode of transport to use if you are in a hurry or have a long way to go.Just spend some spare time exploring the bustle Sai Gon with cyclo. Can Tho is the biggest city of the Mekong Delta in Vietnam. The city is famous for its floating markets, Buddhist pagodas, delicious food, fresh fruit, its large student population, and welcoming atmosphere. Ca Mau is a city in southern Vietnam. It's the capital of Ca Mau Province, a province in the Mekong Delta region, in the southernmost part of Vietnam's inland territory. Cai Rang Floating Market in Can Tho City, together with Cai Be and Phung Hiep, is one of the three biggest in the Mekong Delta. Mekong Delta is the bottom half of Vietnam's two rice baskets, the other being the Red River Delta in the North . The best time to visit Ho Chi Minh City is between December and April, when the temperatures are warm. If you visit Ho Chi Minh City from May to November, the rainy season, the city can be very wet. The weather is normally changeable in a day. You should prepare rain poncho when you go out because we can’t guest when the rain is coming. You should be aware of the two names of the city. For tourists, it’s Ho Chi Minh City, but the locals still call it by its former name Saigon. Traffic jam is a big problem and nightmare in Ho Chi Minh city. Riding motorbike or bike as local people is an interesting experience for foreigners. However, they’re not advised to do so in rush hours (about 7 – 9 AM and 5 – 7 PM) or on crowded big streets as Ho Chi Minh City has traffic jam almost everyday. It would be extremely dangerous. Ho Chi Minh city is the most crowded city in Vietnam. Therefore, safety is a big problem also. You should be aware of your phone or bag when you walk and ride on the road. You should not walk around or explore desolate areas at mid night. Petty thefts are quite common in the city. If someone takes your bag, you can shout out “Cuop, Cuop”. Ho Chi Minh city has the large bus system, but you should check the bus number and route when you catch the bus. On the bus, paying attention and not sleeping on the bus is really necessary if you don’t want to miss your bus stop. Bui Vienstreet is where you can meet many travelers to share your experiences. The pubs and nightclubs buzz with a good mix of locals and tourists, while your tipple is affordable and the music is great too. If you discover Ho Chi Minh by night, you should not catch a motorbike taxi (Xe Om). It’s not safe for travelers. The address in Saigon also slightly long and hard to find. Many street names are overlapped. Therefore, you should get detail and sufficient address to avoid confusion. Ho Chi Minh people are very friendly, so you can ask for directions. It’s easy to exchange money into Vietnamese Dong (VND) in Ho Chi Minh City. At the airport they have a lot ATM , on working time there is also exchange agency, the price is little higher but not considerable. All banks, most travel agents and hotels will happily exchange your USD and other major currencies to VND. There are some gold shops offering good rate nearby Ben Thanh market. Mai Van 1, 1A Nguyen AnNinh, D1; Open 7 days a week from 8:00 am to 6:00 pm/ 08 3823 1836. Saigon Tourist, 45 Le Thanh Ton, D1 / open 7 days a week from 7:30 am to 6:30 pm/ 08 3827 9279. There are ATM’s everywhere in Ho Chi Minh City. Vietnamese banks that accept foreign cards include Vietcom, Sacombank, Vietin, Agribank and Technobank. The most common foreign bank ATM’s are Commonwealth Bank (Australia), ANZ (Australian & New Zealand), HSBC and Citibank although the last two ATM’s are far less common than the first two. Most Vietnamese Bank ATM’s will have a maximum withdrawal of 4-5 million vietnamese dong (~2-250 USD) but you can make multiple withdrawals until you hit your own bank withdrawal limit. 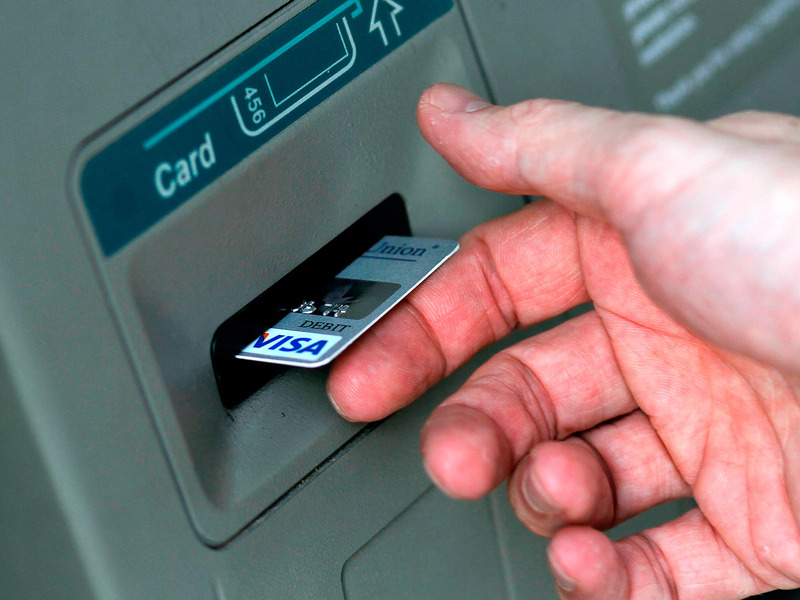 Be aware you may be being hit by a foreign ATM fee every time you make a transaction. The central post office (next to Notre Dam) isn't just a magnificent building and tourist attraction in itself, you can actually post things there. Opening hours: From 8:00 a.m. to 5:30 p.m. The city code for Ho chi minh city is 083. You can place international phone calls from the post office listed above and from most hotels. 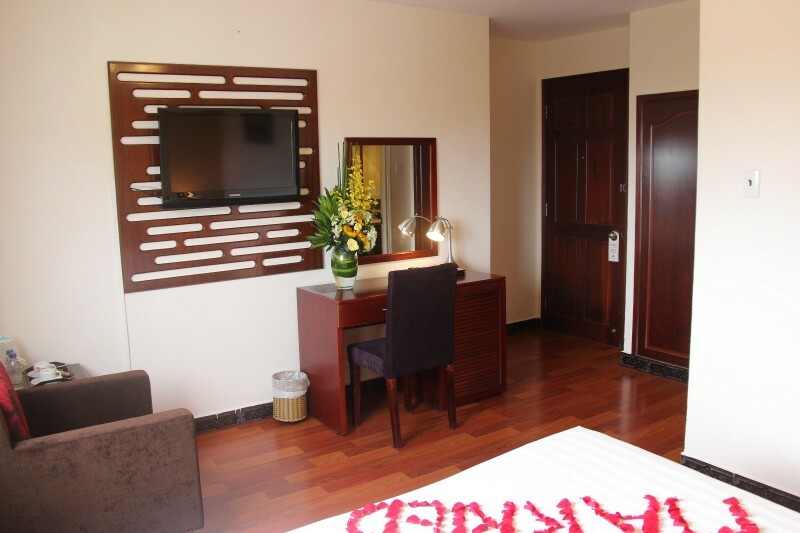 This reasonably priced hotel was well located to get to Notre Dame Cathedral, Cental Post Office, Ben Thanh Market and other places of interest. Room was tidy and clean and bed/ pillows were comfortable, standard breakfast and wifi in rooms, exactly what we expected for a three star hotel. The view from our window at night was absolutely breath-taking. Ho Chi Minh City is very famous for food. You can take a food tour (especially food tour by motorbike) or go ahead to discover themyourselves. We had amazing food time in this city. It’s also the biggest reason why we will come back to HCM in the near future, for sure. You can check thefollowing list of Top Food in Ho Chi Minh City. It’s really a great suggestion. No trip to Sai Gon is completed without trying Com Tam Suon Bi. Apart from being made by the special rice, Com tam is served with a grilled pork chop on top. Local people usually eat this dish with fish sauce, cucumber pickles, green onions, and chilies. Moc broken rice restaurant is famous for Com Tam, a popular dish of Ho Chi Minh peple. This dish that has always been highly recommended by locals and in foreign guidebooks. Derived from TrảngBàng town, TayNinh province, Banh Trang Trang Bang has become a not-to-be-missed food for all tourists coming to Sai Gon. 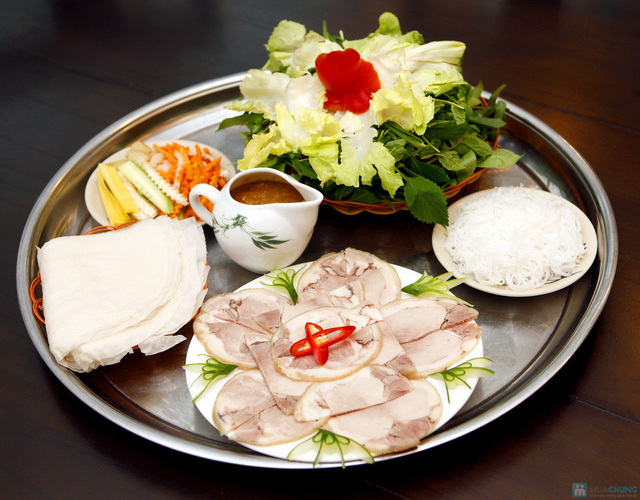 Hủ Tiếu Nam Vang is another day-to-day food for all Sai Gon citizens. Why is it so popular? This can be explained for the cheap cost, delicious filling and widely available in every corner streets in Sai Gon of this dish. Hu Tieu Nam Vang Tylum serves the best noodle which is initially the food of Chinese. Then, it's is adjusted to suit the Vietnamese people and become of Vietnamese specialty. Next up is another noodle in Sai Gon, which has a completely different taste from Phở. It is BúnRiêucua (bun rieucua). Bun Rieu Nguyen Canh Chan is famous for its Bun rieu cua, a very popular dish of Vietnamese people, especially for breakfast. Ho Chi Minh City is truly a shopping paradise for every style, budget, medium or luxury. This city has a wide range of shopping venue options: luxury malls, specialized large “box” stores, small and cute boutiques, tourist markets, local markets and even shop-front-lined, dedicated shopping streets. Ho Chi Minh City is a fun place to shop for bargains, too. Ben Thanh Market is a large marketplace in the downtown area of Ho Chi Minh City, Vietnam in District 1. Vincom Center is located between Notre Dame Cathedral and Saigon Opera House. It boasts has eight levels that house more than 250 shops and services. Diamond Plaza is a beautifully renovated department store in a Ho Chi Minh City surrounded by many of the city’s most attractive sites. An Dong market, known locally as The Craft Market, is famous for handicraft items, its fabrics, and the best souvenir or gift. Brand "Khaisilk" is one of the features of the fashion industry in Vietnam. There are products for children, men, women of all ages, all sizes. Tara & Kys Art Gallery considered as a new destination and attraction for tourists. It has the a largest contemporary art exhibition in Ho Chi Minh City. Parkson is the retail arm of The Lion Group, an international conglomerate which has its beginnings in manufacturing and trading operations in the 1930s. As we didn’t have enough time to explore all the places, we only visited three of them: Ben Thanh Market, Bin Tay Market (Cholon Chinatown Market) and Parkson Plaza Department Store. Ben Thanh market was the busiest local market which had almost everything you need for daily life. Cho Lon Chinatown was really impressive by combining shopping with cultural experience. Parkson Plaza was a modern shopping center with a great food court. They all made our trip! If you consider about your budget, don’t worry. HCM City has many free things to offer. And luckily, they are all the highlights of the city. Ben Thanh market is the most well - known stop among hundreds of shopping sites in Ho Chi Minh. In this market, no one pushes or forces you to buy their stuff. They just speak some broken English sentences to ask you buy something in case you are in need. There is no better place to take a peaceful break from the crowded city than ThienHau Pagoda. Also worth a mention is Sai Gon Cathedral of Notre Dame. Another French colonial building in Sai Gon is the Central Post office. The young people aging from 17 to 23 run the tour without any benefits with a slogan: “Your smiles are our happiness”. 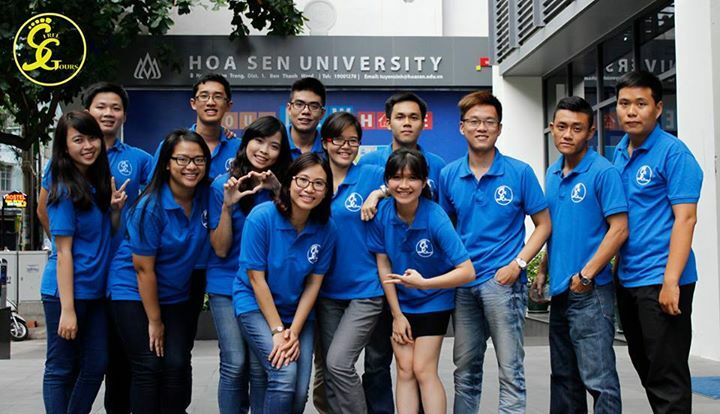 Their aim is to create memorable moments for foreigners and improve their English speaking skill. If you are looking for a place to step away from the streets of Ho Chi Minh, Tao Dan Park is definitely a place to be. This leafy park is just behind the Reunification Palace – another popular destination in Ho Chi Minh. It seems a great way to spend a few relaxing hours watching the local doing exercise or simply reading a book without paying. Not many museums in Viet Nam are free of charge. Luckily, San Art Laboratory is one of them. San Art is home to various outstanding work arts. It’s designed to inspire the creativity in all of us. If you are an art lover, don’t miss the chance to get intrigued and amused at San Art Gallery. Day 1 Tan Son Nhat International Airport ,Asian Ruby Central Hotel, Nem Restaurant, Reunification Palace (Hoi Truong Thong Nhat), Nhà Hàng Creperie & Cafe, Notre Dame Cathedral, Hard Rock Cafe, The Golden Dragon Water Puppet Theatre, A Soi Restaurant. International airport of Tan Son Nhat international airport is in the south of Vietnam. It is located just 8 kilometers from the city center. We flew using a morning flight and it took us about 1.5 hours from Singapore to Tan Son Nhat International Airport. The airport was opened in 2007, still looked new and bright. Nem Restaurant serves the best "Nem", specialty of Vietnam as the name suggests. Nem Restaurant, this restaurant was rated by CNN as a place that served the best spring roll – a square shape deep fried spring roll filled with crab meat. Make sure you get the right address with exact number when locate the place to your Taxi driver. They only served two types of food: Cha Gio, the Crab meat spring roll, and Bun Chan, the vermicelli eaten with grilled pork and veggies, topped with Nuoc Cham (dipping sauce). Reunification Palace is an architectural work in Ho Chi Minh City. This used to be the largest-scale projects south and the highest construction costs. It's more interesting if you know some of the history. You should find it on-line before going. You don't forget to dress well so as to walk a lot. It’s a great place to chill and relax. The journey to Vietnam would never complete without drinking its coffee! It is next to the post office so you can combine them together in one trip! Hard Rock Café, located in the Kumho Asiana Plaza, is a vibrant bar where you can enjoy live music as well as shop the Hard Rock iconic products. Water puppet show upholds the culture, the traditions of this country and is acted like normal human beings by the well-trained artists. They have two shows per day: 5pm and 6.30pm. You can even buy copies of the puppets for very fair prices and keep three of them on display at home. It is great for kids, groups, couples, etc. You don't forget to enjoy Bia Saigon, the local Saigon beer. There was a shooting range too where you could have a chance to fire number of assault rifles and light machine gun by paying some additional money (around US$1.20/bullet). Parkson Plaza is a successful model in Vietnam offering a wide choice of items for shopping at a modern system. It is really a wonderful heaven for shopping. There is a food court located inside the Parkson Mall. You keep walking to the mall and asking the way to the food court. Cá Kèo Hot Pot serves the best specialty of the Western South areas. They sell mainly the Hot Pot or grilled Goby Fish. Overall, it's a very good meal and very great experience. Ca Keo Hot pot smelts really great but you must eat it carefully since there were lots of bones. There is section of the market where food stalls serve local dishes. If you are a culinary adventurer and don't mind the flies, then try the local dishes which are very cheap. Negotiating the price is a real must here. The western part of the city is dominated by Cholon (Chinatown), a thickly settled district rife with teahouses and pagodas and the famous BinhTay Market. It's very busy place, the prices are cheap and there are lots of shops to look/ buy. Most of the items are wholesale but they are happy to sell individual items. Thien Hau Pagoda is one of the most active temples in Cho Lon and has an otherworldly atmosphere owing to the smoking rings of swirling incense and majestic interior furnishings. It's an interesting temple right in the middle of the China Town with unique atmosphere and not far away from the main market. If you combine this with some walking/driving around to get a sense of this area with more than a million residents, then definitely make the stop. There are lots of worshippers here so tourists need to be respectful and considerate. Quan Am Pagoda is the most active and colourful temples in Cho Lon. QuanThe Am Bo Tat, literally 'the Bodhisattva who listens to the cries of the world. Then, we walked along the NguyễnTrãi Street, passing by shops and wet markets. The restaurant's a family owned type, where the family secret broth recipe was passing down from one generation to another. Bonsai River Cruises offers two multi purpose boats, built to follow the slogan ‘events - dining & more’. It serves as an event, dining and conference center in lieu of meeting in the ‘sterile, tedious surroundings of a business center. They had buffet spread in the middle, mixture of hot and cold appetizers, main course, and desserts. It's around two hours and they had entertainment like interactive dance with guests, live music, even magic. Day 4 Tan Son Nhat International Airport..
09:00 Tan Son Nhat International Airport.